While you are busy getting the interiors of your RV looking great and well lit up, let’s have a think on the exterior for a few. Take a look at how it looks on the outside at night and if it needs any extra lights. You might be surprised. The RV is going to be your home for the next few days, weeks, months or indefinitely, so you’ll want to decorate it like you would decorate a house. And no outdoor decoration is complete without DIY LED underbody light kits. They are not only easy to use but also an affordable way to give your RV a fresh look and keep the rodents away during the night too. There are typically two ways to control the LED underbody light kits. Both names are self-explanatory. 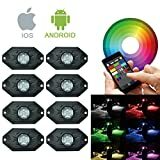 The Bluetooth on your phone connects with the Bluetooth of the under lights, which you can use to switch-on, switch-off, and dim and increase the lights. The second option you have is a remote control, which comes with the kit. A Bluetooth control is better because you don’t need to replace any batteries. Also, remote controls are lost easily, especially if you have small kids traveling at home who get into all types of things and lose it. The most crucial part of your purchase is a great warranty since the lights will be exposed to harsh weather, water, and winds all the time you’re on the road. Generally, companies offer 10 years of warranty but there are a few that offer a lifetime warranty. If you find one that does, grab it. You never know what can fly up on the road from a tire, or other accidents that can occur out there. The lights should come wrapped in a protective film like polymer that protects it from wind, dust, water, extreme cold, and extreme heat. The metal fixtures should have an anti-corrosive coating and protect the lights from shock and pressure. Durable design and product life go hand in hand because using good quality materials prolongs the life. Whichever product you choose, should offer at least 50,000 hours of light without getting yellow or dull. Some companies also offer lights that work underwater too. 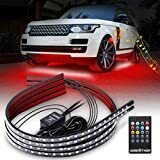 Since you will be using the lights for your RV, go for a truck under light kits because they come with extra long wires. The car kits are smaller, so you might need extra wires. Yes, we know they can be a pain to find. There should be practically no cleaning required. Even if you want to clean them, use a dry paper or cloth for the work. You will install the kit on your own, so they need to be easy to install. The kit should come with everything you need from an installation guide and lights to wires, connectors, and remote control. They should be a universal fit and can install on any RV or motorhome. *a quick note on safety and the law. Do check your own state laws out for yourself. There are two types of under lights — LED and neon. Regardless of the ones that you are using, green, blue, and red lights are not permitted to be “on” while on the road since they should only be used during an emergency by emergency vehicles. Crowded and high-traffic states like California and New York have stricter rules for safety. For example, in California, you can switch on under lights only when you are in places other than public areas. In Vermont, you will be fined if you keep the lights switched-on while driving. On the other hand, the Alaska state government only allows subtle under light colors like amber, yellow, and white. A product perfect for highlighting the best parts of your RV, the Amak LED RockLight Kit comes with a 365 days manufacturer’s money back guarantee. The kit includes four light pods, each including three lights fitted with CREE LED Chip, which not only makes them brighter but also prolong its lifetime. The pods have a durable design that protects them against heavy impact, extreme weather, and change in pressure. It is fitted in die-cast aluminum shell sealed with a thick glass making them waterproof, heatproof, dustproof, and rust-proof. It uses 9 to 32 volts of electricity and is easy to install. The lights have a lifetime of up to 50,000 hours without getting dull. The kit is available in five different colors including green, red, blue, white, and yellow. Apart from RVs, you can also use them to light up your motorboat, golf cart, ATV, sportbikes, and more. With the lifetime warranty that you receive, the kits are one of the best products available in the market. Super bright and colorful, the Xprite Underglow Underbody System Neon Strip Lights Kit is fitted with SMD 5050 LED Chips. They ensure a brighter and uniform output that highlights the best parts of your RV. You can control the three-in-one lights using a remote control. It can adjust the brightness from a distance of 100 feet. The kit includes eight preset static colors, four lighting effects – two preset jump and two preset fading patterns, and four active sound modes. They are encased in a heavy-duty rubber casing that protects from diverse road conditions and make for great RV awning LED lights. It also comes with a control box or sensor, six feet extension wire, cigarette plug with the switch, and a positive and negative power cord. You can easily bend it to take your RV’s shape. The rubber tubing has received a waterproof rate of IP67. It is also high and low temperature resistant. For installation, all you have to do is connect the plugs and peel off the pre-applied adhesive tape to stick the rubber tubing under or around the sides of your RV. 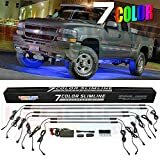 A decently-priced product, the LEDGlow 6pc Multi-Color Slimline LED Truck Underbody Underglow Light Kit is the answer to all your worries. It comes with 324 SMD LEDs that are divided into two 46”, 36”, and 24” each tube. They are convenient to use and save space since you can easily stick them only on the visible parts of your RV. They can be bent into any shape you want and offers a consistent glow. It also comes with a remote control that you use to operate the different functions via the control box. The available functions include six flashing patterns, six scanning modes, two color cycle modes, two sound activation modes, and two chasing modes. It reacts to the music that you are playing inside your RV. It features seven solid colors that alternate among themselves depending on the mode you choose. These include blue, red, green, light green, purple, teal, and white. You will get a one-year limited warranty from the manufacturer on purchasing the kit. Rock Solid Construction. Die-cast Aluminum Housing With Toughed Glass. 500 Lumens. Flood Beam (120 Degrees) and 50,000 Hours of Life Span. SUNPIE LED Rock Lights Pod Lights Kit is a Bluetooth-controlled product that comes in two sizes — four and eight pods. It is compatible with both, iOS and Android devices and offers a series of modes including music mode, flashing, and automatic control. You can also change the brightness level. The lights are encased in a superior quality die-cast aluminum and covered with thick glass for added protection. It has a total life span of over 50,000 hours. And like all under lights, this kit is also waterproof, dustproof, shockproof, and rust-proof. 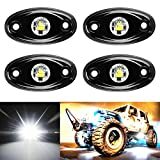 You can use them as indoor lights, reverse, off-roading, and dome lights as well. Other than that, the installation process is a breeze and takes very little time. Connect all pods together before you connect them to the power to avoid one of the lights from burning out. 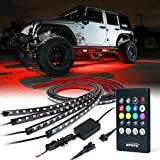 AMBOTHER Car Neon LED Underglow Lights Underbody Exterior Lighting Kit is a four-strip light kit that operates using a remote control. You can change its color, brightness, and switch them on and off using the remote. You can bend them the way you want, which makes the strips perfect for decorating RV wheels and rooftop. They are compatible with any electricity source between 10 to 15 volt. The LED lights are encased in a durable rubber tube and covered with PVC, which is waterproof(IP68) certified. You can interchange between eight colors, which include red, green, blue, white, orange, yellow, cyan, and purple. The kit also offers some cool features like two preset jump patterns, two preset fading patterns, and four sound active modes that blink according to the music you are playing inside the RV. Installation is easy, and you don’t need to drill or nail the strips. You get a double-sided adhesive tape in the kit that you use to glue it. It comes with a one year warranty. After reviewing and debating over all five of these, we have a clear winner, which is the 4Pods LED Rock Light Kit. It has a product life of 50,000 hours, which is incredible since you will be needing them a lot while out in unknown territory. The durable lights come with a lifetime warranty, which is one of its biggest advantages. You can choose between five colors, which include green, red, blue, white, and yellow. And the lights are encased in a die-cast aluminum shell that protects them from extreme weather, water, dust, and heavy impact. They are affordable and easy to install, which are two more qualities that I can certainly appreciate. Also, the company Amak is known its excellent customer service in the space, which is just another plus.